Zandu K4 Tablets Cures Urinary Tract Infection (UTI), Urethritis, Burning Micturition, Crystalluria, Renal and Urinary Calculi, Cystitis. 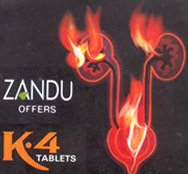 Zandu K4 Tablets- Cures Urinary Tract Infection (UTI), Urethritis, Burning Micturition, Crystalluria, Renal and Urinary Calculi, Cystitis. Contains premium "Chandraprabha" - a proven urinary antiseptic. Exerts pH re-normalizing action, therefore provides cooling action in the urinary system and relives burning micturition. Offers diuretic and antiseptic action, thereby flushes small stones from the urinary tract. Brings about decongestion and soothing effect on the inflamed mucus membrane of the urinary tract. K-4 is a very effective combination of various Ayurvedic Medicinal herbs which help to decongest urethral obstruction caused by prostatic hypertrophy, clear urinary tract infection, disintegrate and expel urinary stones and prevents recurrence. Benign enlargement of the prostrate gland due to the aging process may progress to the point causing obstruction of the urethra and may require surgical intervention. But surgery is not without risk because of old age and other associated conditions. Sometimes surgery is not possible at all because of cardiovascular and respiratory disorders. Chandraprabha is very useful as urinary antiseptic, diutertic, anti Inflammatory with antacid and laxative action. It promotes flow of urine and helps in dissolution and removal of urinary stones by its lithotropic action. Chandraprabha also reduces albuminurea, controls urinary tract infection and brings about decongestion and soothing effect on the inflamed mucous membrane of the urogential tract. Rejuvenator, cholagogue, liver stimulant, appetiser and general tonic. It has diuretic, antispamdosic, anti-inflammatory, antipyretic properties and useful in urinary diseases as it has been found to inhibit the growth of E.Coli in vitro. Urinary antiseptic and the world’s safest purifying herb that combines detoxification and elimination with strength giving properties. Is a compound of five drugs-aloes, ferrisuplh, cinnamon cardamom, ginger and confection of roses. It is used as mild laxative, ecbolic and diuretic. K-4 is extremely useful therapy in the management of early and moderate enlargement of the prostrate gland where an operation may be completely avoided. K-4 provides prompt relief from nagging symptoms and helps to control: Frequent urge to pass urine at night Dribbling, slowness and difficulty in passing urine. Poor stream and feeling of incomplete voiding. Burning micturation. 2 tablets twice daily for 4-5 days. To prevent recurrence after surgical/non-surgical removal of calculi, 2 tablets twice daily for the first month and thereafter 1 tablet twice daily for next 4-5 months. 1 st trimester of pregnancy.